Hawk identification often begins with a general description of hawks as the group of large birds in the order Falconiforme, which consists of Eagles, Falcons and Hawks. Together with Owls, they also go by the name raptors or birds of prey. Hawks tend to occupy a top spot in their ecosystem food chain and therefore get designated as indicator species because population changes often coincides with ecosystem changes. The snowy owl, for example, a resident of the circumpolar north, occasionally migrates further south. Above average Snowy Owl populations during one year might be sufficient to disrupt their food source from year to year. Most types of hawks migrate South for the winter, with the migratory season an especially fun time for birders. In some areas of South Texas, the sky can fill with tens of thousands of hawks as they cruise the heat thermals on their way to their winter destination. 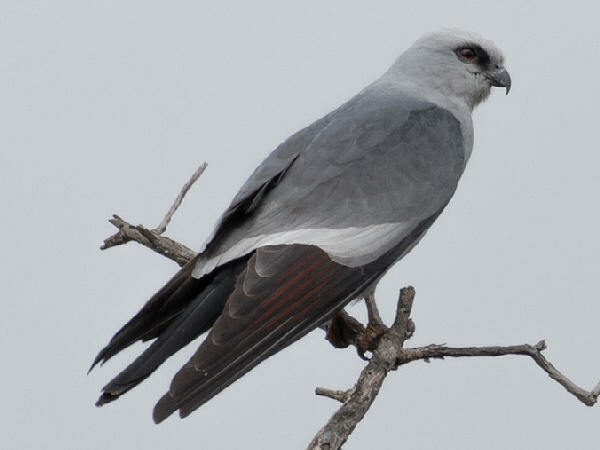 The Mississippi Kite is the general exception to the rule. It’s a neotropical species that breeds in the Southeast. The four Falconiforme families listed below provide a first look at the North American birds of prey. Sagittariidae: The Secretary Bird of sub-Saharan Africa is the only species in the family and therefore not well known to the North American audience. The Osprey represents the entire Pandionidae family because it’s the only raptor that relies on a diet of fish. Like all raptors, Ospreys possess keen eyesight and strong flying ability. They also have sharp talons on their feet. When they glide above a water body, they spot a fish and then dive to grab it with their feet. 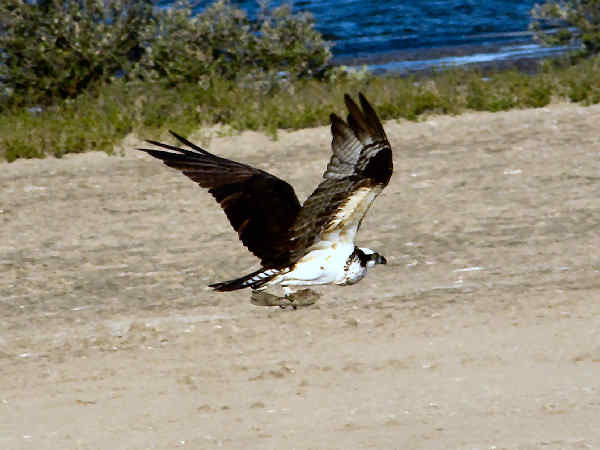 Ospreys migrate during spring and summer. During the summer breeding seasons, they nest on high platforms around water sources in the northern latitudes of the Eastern, Midwest and Western United States. Three Cathartidae species, the California Condor (Gymnogyps californianus), Turkey Vulture and the Black Vulture reside in North America. 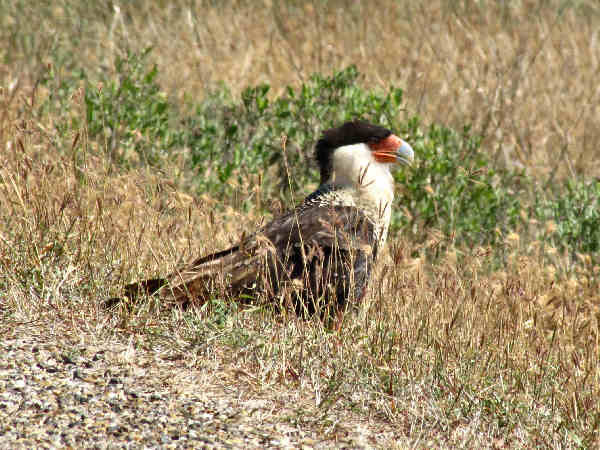 Most attention goes to the California Condor, North America’s largest land bird. At year end 2008 California Condor population estimates were 154 in captive breeding programs and 168 in the wild. Recent evidence suggests that a warming climate may extend the range of the Black Vulture (Coragyps atratus), a native Southeastern species, as far north as New York State. Along with being smaller than its counterpart the Turkey Vulture, the Black Vulture is an opportunistic feeder, not only scavenging for carrion where available and killing, but also killing live animals and birds, including domestic animals. A six foot wing span, along with a red face defines the Turkey Vulture (Cathartes aura). 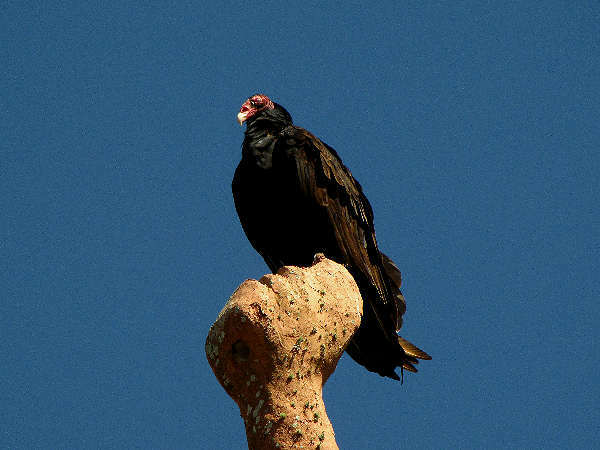 While they are communal nesters, turkey vultures often search for food singularly. 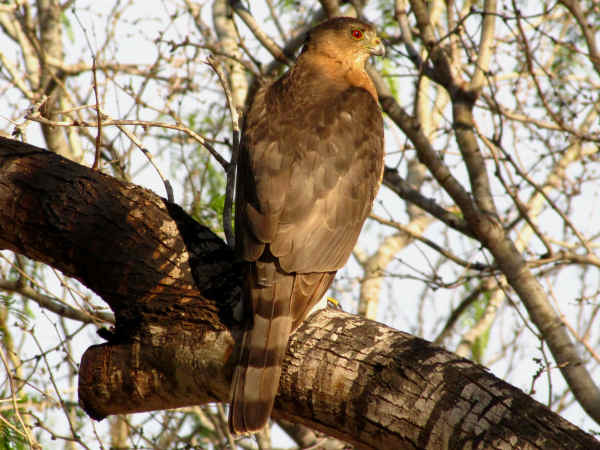 Most accounts list approximately sixty different species of falcons and caracara around the world. 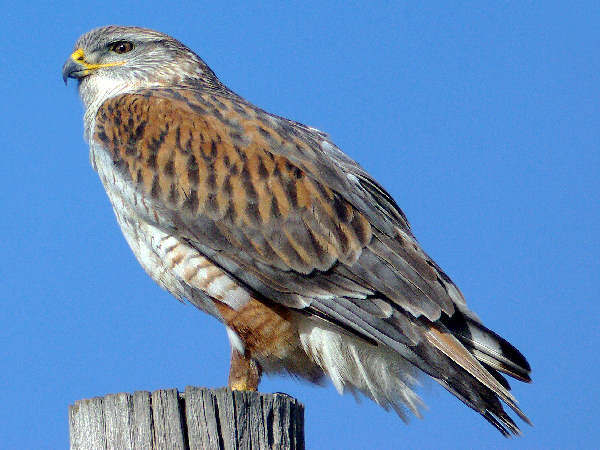 Six falcon species, American Kestrel, Aplomando Falcon, Gyrfalcon, Merlin, Prairie Falcon and Peregrine Falcon are classified as North American native species. 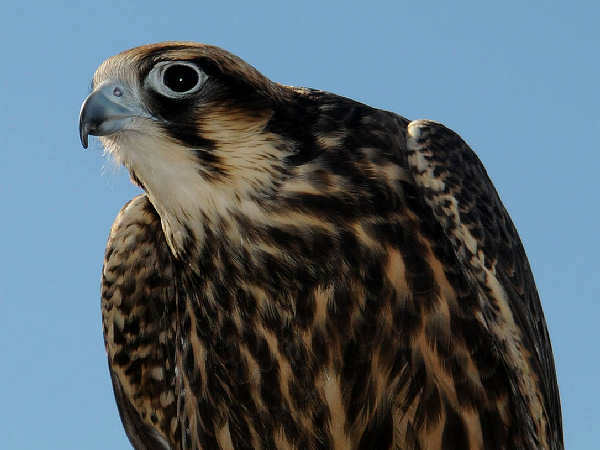 Today, Peregrine Falcons are making a comeback in New York City. We currently know of 16 falcon couples, or 32 falcons total, that live year-round in unique places throughout the City such as on top of bridges, church steeples and high-rise buildings. The Peregrine Falcon, along the the American Bald Eagle gained additional publicity because of dramatic population declines experienced by both species in the 1960s due to the widespread use of DDT. The subsequent ban on the use of DDT, along with a large scale captive breeding program has helped restore the population to healthy levels. The falcon was removed from the endangered species list in 1999. Today’s city falcons, coastal falcons and mountain falcons provides confidence that the current population will remain healthy. American Kestrel are small in size, with a slate gray color on the head. 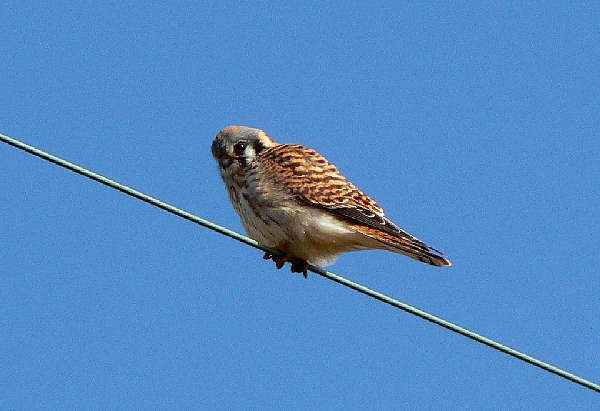 As the picture shows, they often perch on telephone wires around fields in search of prey. Their range extends across the United States. 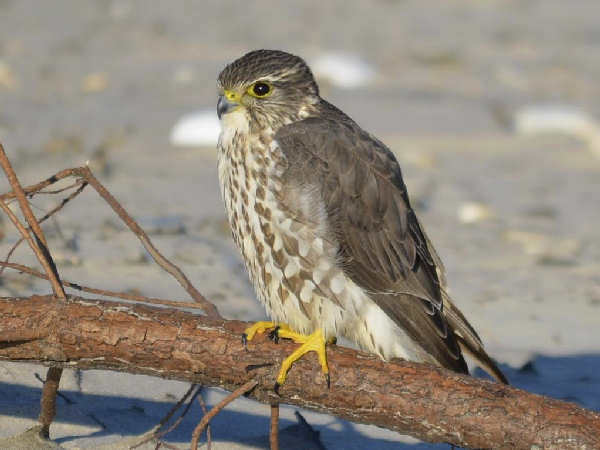 Merlins are another smaller sized falcon that breed in Canada and winter mostly in the West. They have been historically a favorite of falconers and they become acclimated to urban areas. Accipitridae species diversity ranges between roughly 215-235 different species, depending on the reference used. 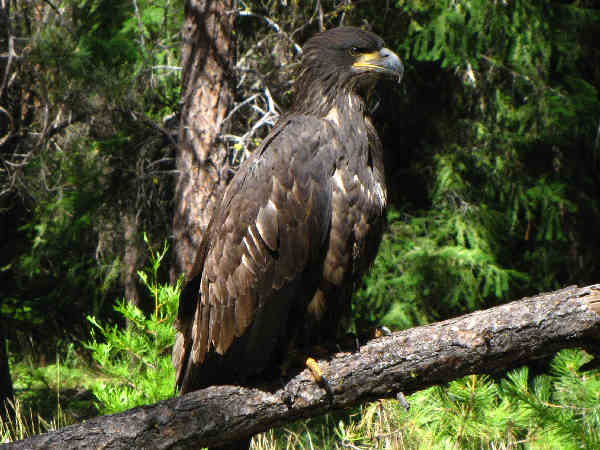 Twenty four Accipitridae species reside in the United States, including the national bird, the American Bald Eagle (a juvenile bald eagle received the top picture spot on this page). While most Accipitridae nest in trees, their habitat extends to any area that has at least a few trees for nesting, including fields and forests. Their diet consists of a variety of rodents and other small mammals. The types of hawks in North American divides between two genera, buteo and accipiter. Representative species of both types of hawks are presented. Buteo hawks, the most common native hawks, share many physical similarities with eagles. Generally smaller slower fliers, most Buteo species live in open area habitat such as grasslands and prairies. The picture at the top of this section shows a Ferruginous hawk. They are a western species with some spillover into the Midwest. The large size and white chest feathers are good field identification clues. Red-shouldered Hawks (Buteo lineatus), for example, inhabit forest areas of the Eastern the United States. This primary population gets complimented by a small and distinct West Coast population, located mostly along the California coast. 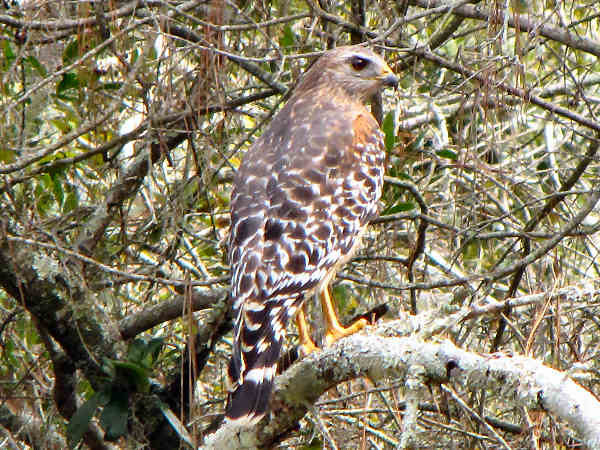 The picture shows typical red-shouldered hawk behavior, perching on tree branches or other tall fixtures as it searches for food such as small mammals and reptiles on the forest floor. Other than the northern most populations that migrate to Mexico during the winter, most other Red-shouldered hawks are year round residents of their established territory. 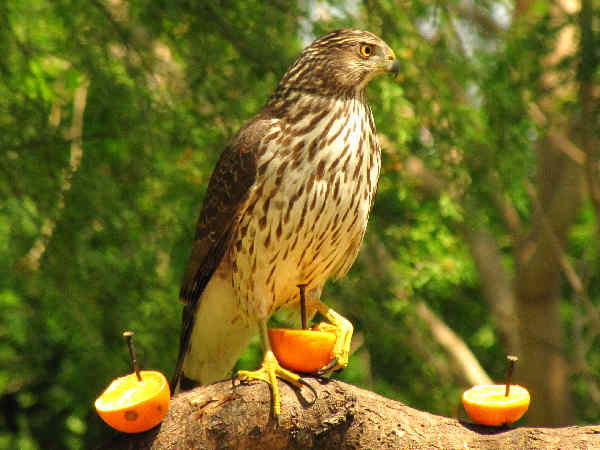 Cooper’s hawk (Accipiter cooperii), also migratory forest dwelling birds, live year round in many areas of North America. During spring and winter migrations they fly north to Canada to breed, and then fly south when the weather turns cold. Cooper’s Hawks and Sharp-shinned Hawks often share very similar physical characteristics. 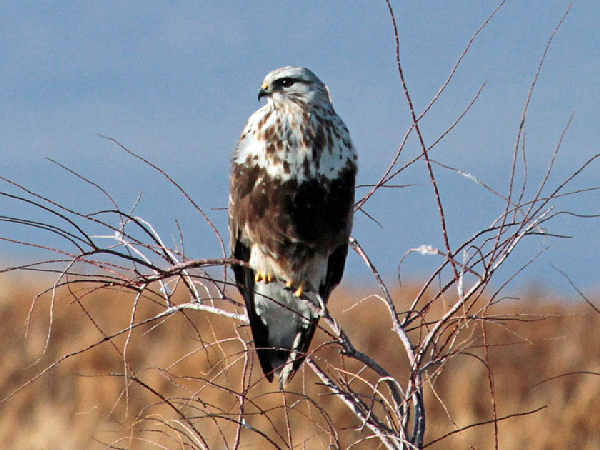 Rough-legged Hawks can be identified by their feathered legs. In flight the white tail and black band at the bottom are another good identification clue. They breed in the arctic and during the winter they migrate south in many areas of the United states, with the exception of the Southeast. Finally, having good pictures to review after the fact represents a great hawk identification tool Sometimes being in the right place at the right time is all a photographer needs to capture a good set of hawk pictures. The zoom range on both the point and shoot and SLR digital cameras on the market also makes it easier to photograph most hawks in their natural environment, posing on trees, telephone wires and fence posts. Exceptional eyesight characterizes the species and leads to a great photography tip. When spotting for hawk subjects never look them in the eye during the approach. They can easily pick up a photographer’s eyes, and they tend to spook or fly away upon approach. Slowly approaching a hawk head down, while looking at the camera screen increases the possibility of getting close enough to the subject to snap a couple of nice pictures.